Dr. Hari J. Krishna, P.E. The first person to be recognized by ARCSA for their contributions was Dr. Hari J. Krishna in Seattle at the 2005 ARCSA Annual Conference. The American Rainwater Catchment Systems Association was founded in 1994 by Dr. Hari J. Krishna in Austin, Texas, as a 501(c)(3) non-profit organization to promote rainwater catchment systems in the United States. 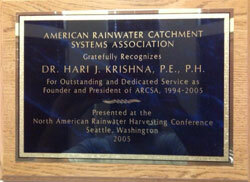 Hari was the first President of ARCSA and dedicated 11 years to the association's establishment.